Is there a limit to how much you can thin water based paint (latex/acrylic) without doing chemical damage? I’m sure it will effect coverage, but if that is the only problem, one can just add more coats. My real question is can you thin water based paint enough to spray through a small sprayer with 1 mm to 1.5mm needle or smaller? all latex paints are not the same. experiment with a 10% dilution and go from there up to 25% and see what works for you. I’d check the label, there are limits to how much you can thin before you mess up the chemistry. 10% is a good (common) starting point, but the label will give you the max…don’t exceed that. I’ve sprayed 100% acrylic paint with a 2.0 MM needle set (HVLP) and it worked just fine…but they will all be a little different in that regard. I think that how much you can thin latex paint depends on the type & brand. I would first check the label to see if it says anything about thinning. If not, check with manufacturer’s website or the store if it is one that just carries their own brand. I’ve never used it but you might also look into an additive such as Floetrol which is specially design to make latex paint flow better. Thin it 100% it will last a long time until it dries.. BUT there isn’t any color in water even though it covers good! I have some acrylic paint that I tried to thin enough to spray with a small spray gun. It has a 0.8, 1.0, and 1.2 or 1.4 tip. I reduced a sample of the paint about 50% and it still would not spray. There is not much point in experimenting further if I’m ruining the paint. I had the pressure at abut 35 psi. I could go up to 60 psi with this gun. Not sure if that would help. I’m guessing that it won’t if I can’t thin more than 25%. different results with different brands of paint. temperature – humidity – PSI/CFM – type of sprayer, yada yada yada. 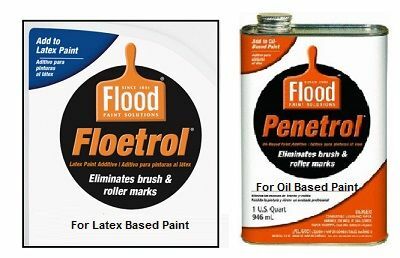 do not get Floetrol confused with Penetrol – which is for Oil Based Paint and Varnish. I hate floetrol, Go up to 25 – 30%. If it still doesn’t spray look for another gun. Home depots have Husky brand Siphon feed spray guns for 49.00 that should work. Thank you for your comments. However, you have kind of missed the point of my question. I am using a small gun because of the detailed work I am needing to do. I got the gun specifically because it is only slightly larger than an air brush. I don’t want a gun made for painting large surfaces. With that, I would like to spray a water based paint if possible. Hence, my question: how much can you thin acrylic or latex paint without ruining it? If using acrylic/latex in this gun is just not possible, I guess I’m left with using automotive paint unless pigmented lacquer or poly will work. I think you are left with exploring this yourself. Mix up some 10%, 20% 30% and 40% dilution, see which works best, if at all. If one works but not quite good enough, mix two additional mixes, one with 5% less water, one with 5% more water. And do us all a favor. Please report back here with your results. We want to know too. Like you, I use air brushes and other smaller sprayers. You should be following the manufactures recommendations. Thank you for your comments. However, you have kind of missed the point of my question. I am using a small gun because of the detailed work I am needing to do. I got the gun specifically because it is only slightly larger than an air brush. I don t want a gun made for painting large surfaces. With that, I would like to spray a water based paint if possible. Hence, my question: how much can you thin acrylic or latex paint without ruining it? If using acrylic/latex in this gun is just not possible, I guess I m left with using automotive paint unless pigmented lacquer or poly will work. You didn’t say that in you original post so no one knew. Still you need to thin it no more that the manufacture says it can be thinned. How much can you thin? I can’t say for sure in your case but in my experience, with Latex paints the answer is “not enough”. I have been doing some research lately because I need to paint a set of cabinets and shelves and I have been wanting to try water based paint. Both Benjamin Moore and Sherwin Williams have 100% Acrylic materials that can be sprayed with a HVLP gun. They specify orifice size and it is larger than what I am used to. I have done just what you suggested and have gotten to 40% which will not spray through a 1.0 mm tip. I can, of course, continue with the step by step reductions and will probably reach a point where it will spray. I was trying to find out if this much reduction, and more, will damage the product chemically. It it does, there is no point in experimenting further. I have sent questions to a couple of paint companies. I’ll see what they have to say before continuing further. I have a feeling that they will not endorse such drastic thinning of their product which would be in conflict with directions printed on the can. We’ll see. I’ll let you know. I have sprayed unthinned latex with success. I raised the air pressure considerably though, like 30 to 40 lbs. It goes on slightly “pebbly” but dries O.K. Through a 1.0 mm tip?